David Ellefson 4-String Concert Bass - 'Rust in Peace' 20th Anniversary, 4-string bass guitar from Jackson in the Custom Shop Limited Run Series series. 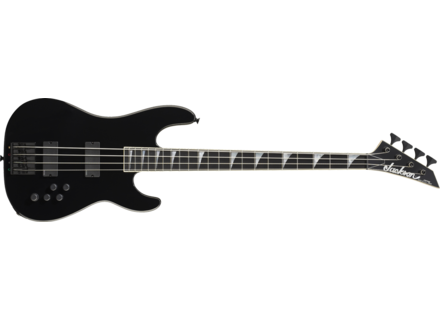 Jackson announces a new partnership with bassist and Megadeth founding member David Ellefson, as well as the creation of the USA Custom Shop David Ellefson Signature Model Jackson Concert Bass. The David Ellefson Signature Model Jackson Concert Bass features a limited-edition burned-in fallout logo and “Rust in Peace” themed case. Additional features include an alder body, quartersawn maple neck with a compound radius ebony fretboard, jumbo frets and pearl sharkfin inlays, one EMG 35DC bridge pickup, one EMG 35CS neck pickup, EMG BQS electronics, a BADASS bridge and Hipshot tuning machines. Fifteen four- and five-string models will be available in Black and Quicksilver. [NAMM] Sandberg Bass Celebrating their 25th Anniversary this year, Sandberg Bass is returning to the U.S. market with a range of instruments for Winter NAMM 2011. New Manne Models Manne has released the list of its instuments released in the past month. [NAMM] Daring Audio Bass Effect Pedals Daring Audio, a new professional music equipment company in California, launches with the introduction of four analog sound processing effect pedals for bass guitar players.